As announced at Emerald City Comic Comicon, Image Comics and Top Cow Productions will release the first original graphic novel from the Minotaur Press imprint, SUNSET, in July 2012. SUNSET, written by CHRISTOS GAGE (Avengers Academy, GI Joe: Cobra) and artist JORGE LUCAS (THE DARKNESS) is a self-contained, black-and-white hardcover graphic novel published in the signature Minotaur Press digest format. The publisher will also offer fans an opportunity to sample the story in a low cost, full-color First Look earlier that month. SUNSET: FIRST LOOK (MAY120527) will be available for comic book stores to order or for fans to pick up at San Diego Comic-Con. In the noir tradition of Chandler and Spillane, comes a two-fisted tale of revenge and redemption. On the surface, Nick Bellamy looks like any other veteran retiree left behind by a modern world. In reality, Nick is a former enforcer, who stole a fortune and years of freedom from his former mob boss. Now, in the twilight of his life, Nick will lose everything except two things: revengeâ€¦ and the chance to die with his guns blazing. 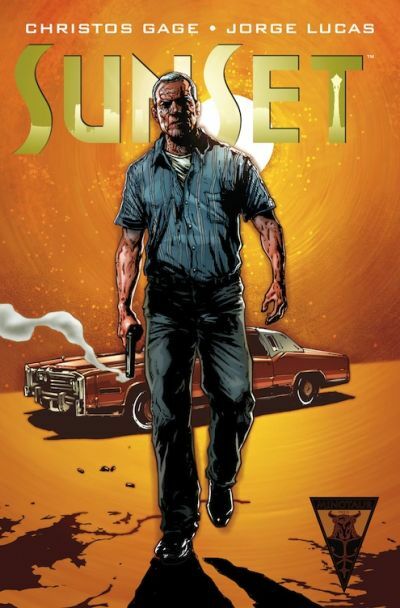 Fans who want to get an advanced look at the original graphic novel will have a chance to do so with SUNSET: FIRST LOOK, coming out July 4th, 2012. Collecting the first 22 pages of the hard-hitting noir tale and priced at only $1.00, SUNSET: FIRST LOOK is a perfect low risk way to sample Minotaur Press’s first original graphic novel. SUNSET HC (MAY120526), a 160-page black-and-white hardcover graphic novel, will be in stores July, 18th, 2012.